Raymond Holton emerged from the burned D.C. housing complex without serious injuries. Engineers inspecting the building heard him yelling and used a crowbar to pry open his apartment door. WASHINGTON – A 74-year-old man who had been trapped for five days in his apartment at a fire-damaged senior housing complex was freed Monday, a chance rescue that came days after District officials announced that all building residents had been accounted for following the blaze. The man, Raymond Holton, emerged without serious injuries and was evaluated at George Washington University Hospital. Engineers assessing the structural integrity of the building heard him yelling and used a crowbar to pry open the door of his second-floor apartment. They found him sitting on a couch. 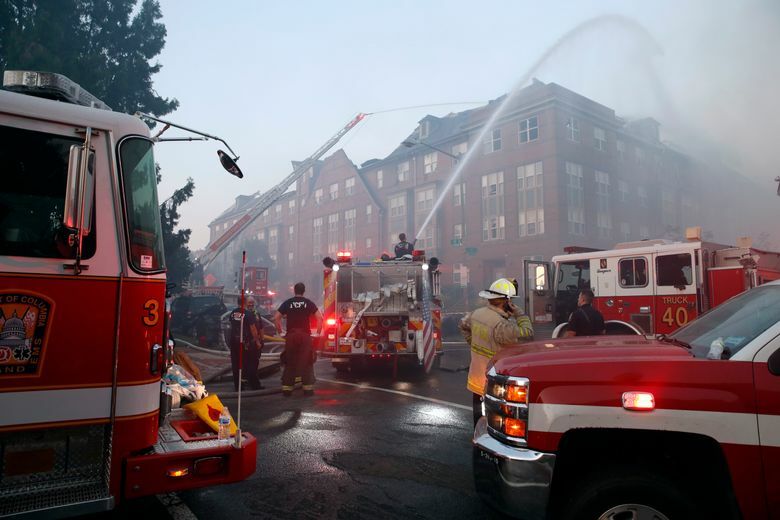 Mayor Muriel Bowser , D, and Fire Chief Gregory Dean blamed the building’s management company, which they said provided the city with an inaccurate report that all residents were safe. That report was a crucial factor in the decision last week by fire officials to suspend further searches of the Arthur Capper Senior Public Housing complex after initial chaotic rescues and evacuation. Officials said they did not want to unnecessarily send firefighters into a building deemed in danger of collapse. “The building was considered unstable and we weren’t missing anybody,” Dean explained. Officials at Edgewood Management, based in Gaithersburg, Maryland, did not return calls for comment Monday. The city official called for a full internal review. “As with any major event, we need to answer what worked and what didn’t,” he said. Fire officials agreed, saying the department would review its search procedures to determine whether their protocols should be changed, and whether they relied too heavily on the accounting by Edgewood. The officials said parts of the roof had begun to collapse and it would have been a significant risk to send firefighters in to check that all 162 apartments and other rooms were clear. After Holton was found on Monday, firefighters and federal agents with dogs searched the building and said they found no one else inside. Police with cadaver dogs started another search Monday evening. The fire broke out about 3:20 p.m. Wednesday and burned into the following day, destroying much of the sprawling four-story complex near the Navy Yard. Firefighters rescued residents from the upper floors of the building and Marines from a barracks blocks away joined the effort. Police officers and bystanders also helped with rescues, and firefighters helped some residents down on ladders as flames engulfed the top floor and attic space. Allyn Kilsheimer, president of K.C.E Structural Engineers, said Monday that his crew discovered Holton as they searched unit by unit and swept the floor to ensure the building was safe for fire investigators. He said the man heard them as they were at his door and called out. Holton said from the hospital that he is “doing all right” and that he had his medication and bottled water during the ordeal. “I’m still hungry,” he said with a laugh. Holton’s apartment has a view of an interior courtyard, not of the street that was filled with firetrucks. Holton said he heard someone banging on his door Wednesday – the day of the fire – but his door was stuck. “They were trying to get in but they couldn’t get in,” he said. He had no idea who it was; several groups were inside the building helping to get residents out. His phone had died. Kilsheimer said the electricity was turned off Saturday night. But Holton said he never became alarmed. Allen, the council member, said one of Holton’s neighbors told him she called the management company worried after not hearing from Holton. It is unclear whether that report was confirmed and what, if any, action was taken. In describing their response to the blaze, fire officials said on Monday that they had performed a “primary” search of the building, which was done while firefighters were still pouring water on flames. That consisted of searching areas deemed most dangerous, in this case the upper two floors, and checking as many rooms as possible. Dean described that as a “quick walk-through.” Holton lived in an area that was not near the main part of the fire. “We didn’t know he was in the building,” Bowser told reporters at a news conference on Monday. Dean said a more extensive secondary search was not completed because of the perilous conditions inside the building. Fire officials said, for instance, that air conditioning units weighing thousands of pounds were dangling from the ceiling. Mark Treglio, director of strategic campaigns for the International Association of Fire Fighters, said there is “no cookie cutter” checklist for rescuers conducting primary searches in a burning building, as safety of firefighters is paramount. The fire’s size, intensity, location and a building’s structural integrity in the moment determines how rescuers manage the scene, he said.